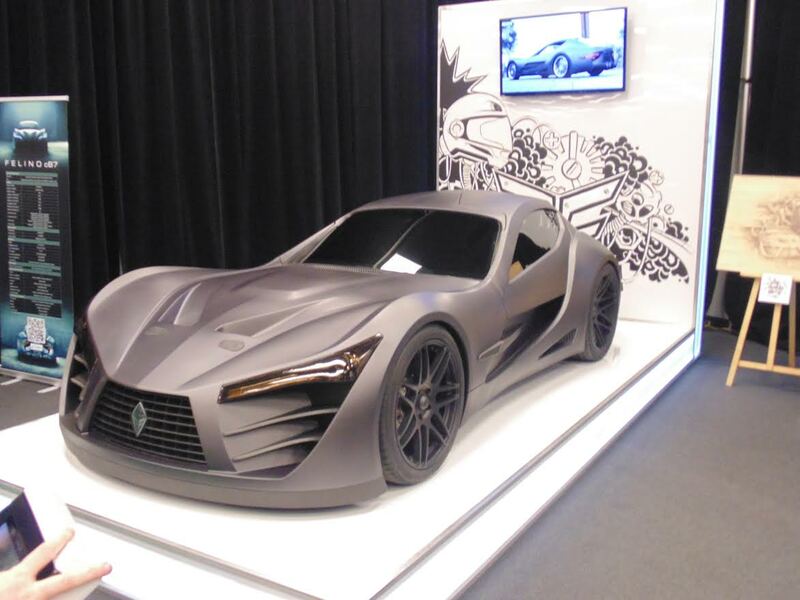 The 2014 Montreal International Auto Show (MIAS) came roaring into downtown Montreal last week. It was held from January 17-26 at the Palais des congres, an imposing multi-coloured glass structure in the heart of this old city. The 46th edition of the MIAS proudly continued the tradition of spurring car sales during a slow time of year in the automotive sector. The show regularly attracts 200,000 plus visitors, and this year looks like it was no exception. 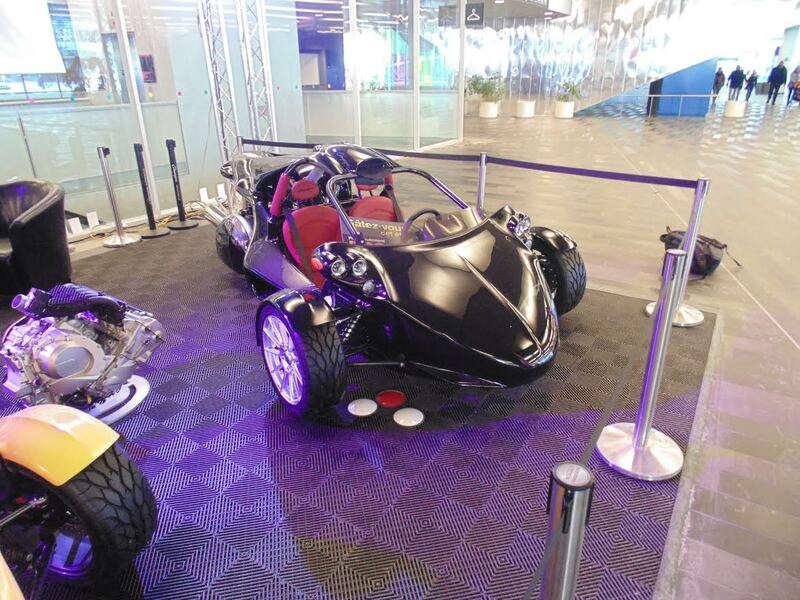 Sixty exhibitors displayed their wares to mesmerized car fans over some 365,000 square feet of floor space. The show boasted more than 500 car models, over 45 of them being Canadian firsts. 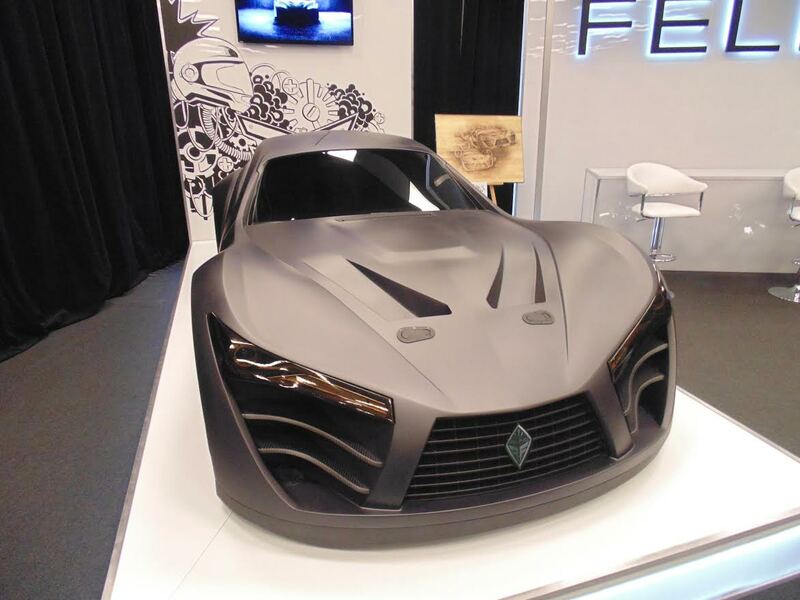 The featured car at this year’s show was the Quebec-made prototype Felino cB7, a daring coupe four years in the making, with looks that could easily place it into one of the Batman movies. The brainchild of former award-winning Quebecois race car driver Antoine Bessette, the Felino is primarily intended as a race car, but could be street-legal as well. It is rear wheel drive, with a 6 speed manual transmission, weighing in at less than 2200 pounds. Final engine specifications will be available this summer, but the car can be equipped with a 4, 6, or 8 cylinder engine. Even with the less powerful engine, due to its low weight, it would still be quite fast. And with that adventurous styling, the Canadian auto industry now has one hell of an image car. 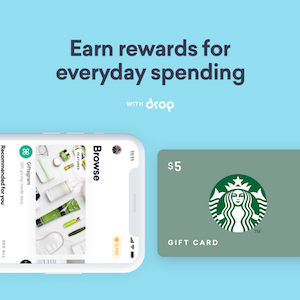 Pricing is expected to be under $100,000. The last stages of testing are now underway, and final production models will hit the streets next year. Another truly Canadian car on the congress floor was the 2015 Micra from Nissan, which meshes Japanese quality with European styling and heritage. 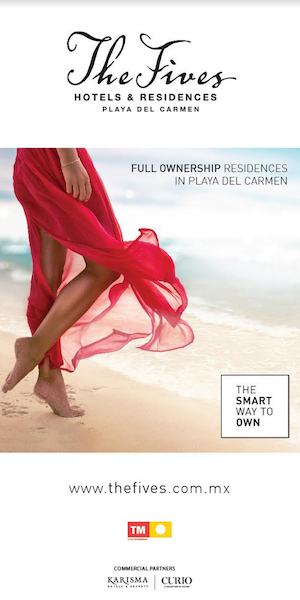 It was extensively tested in our climate, with no plans thus far to sell it south of the border. Available in three trim levels; the S, SV, and SR, you can choose a 5 speed manual or a 4 speed automatic transmission. A 1.6 litre DOHC 4 cylinder engine with dual fuel injection and Twin CVTC will be standard. Head restraints are standard, while safety features like 6 airbags and a Vehicle Dynamic Control System (VDC) are available. Thoughtful features are included like outside heated mirrors, rear heater ducts, and either 15 or 16 inch wheels (sizes widely available as snow tires) are available. Bring on winter! 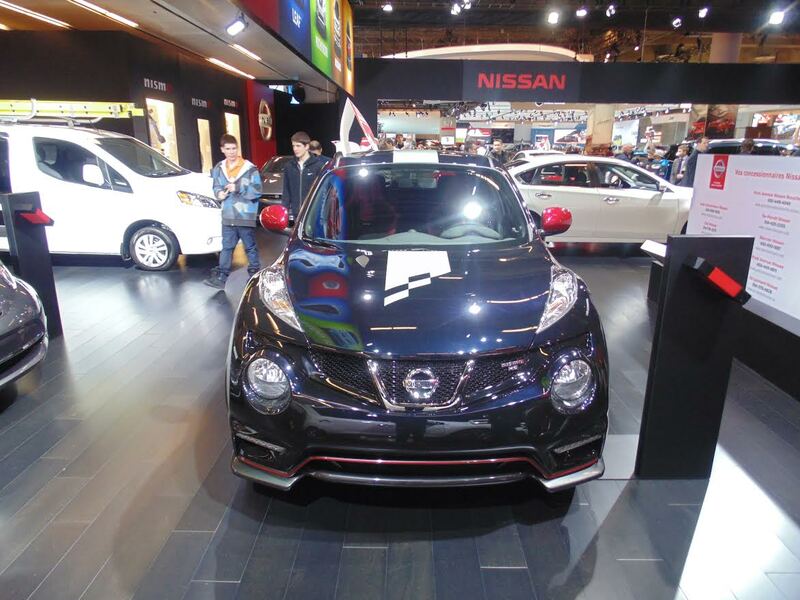 The Juke NISMO RS readily demonstrated the performance and styling wherewithal available within Nissan’s performance team. Horsepower and torque increases, a new manual transmission, larger brakes, a stiffer chassis, and Recaro front seats generated a palpable excitement and will certainly make this one of the brands defining products. 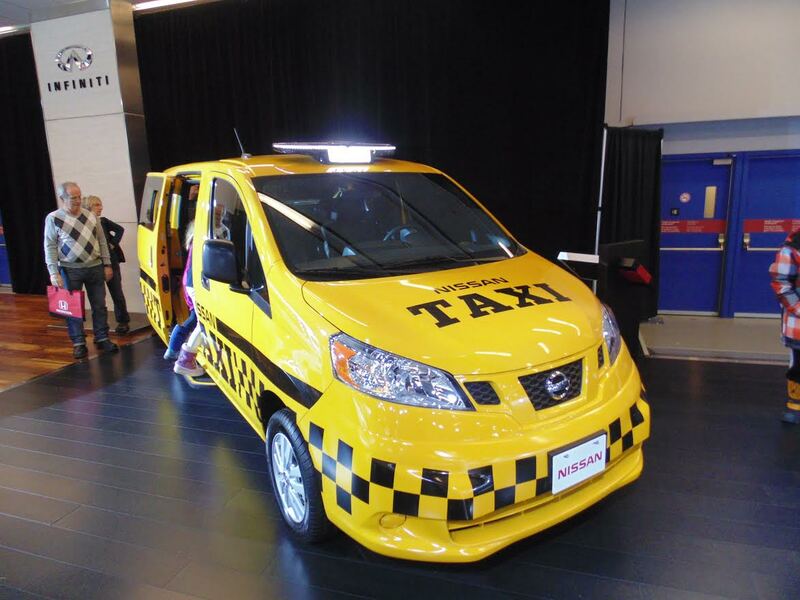 Another anticipated product from this Japanese automaker was its NV200 Taxi, a commercial vehicle currently being used in New York. Occupants are treated to sky views, improved leg room and cargo space (from a car taxi), and enhanced safety features. Plans to release the NV200 for our market will be announced at a later date. 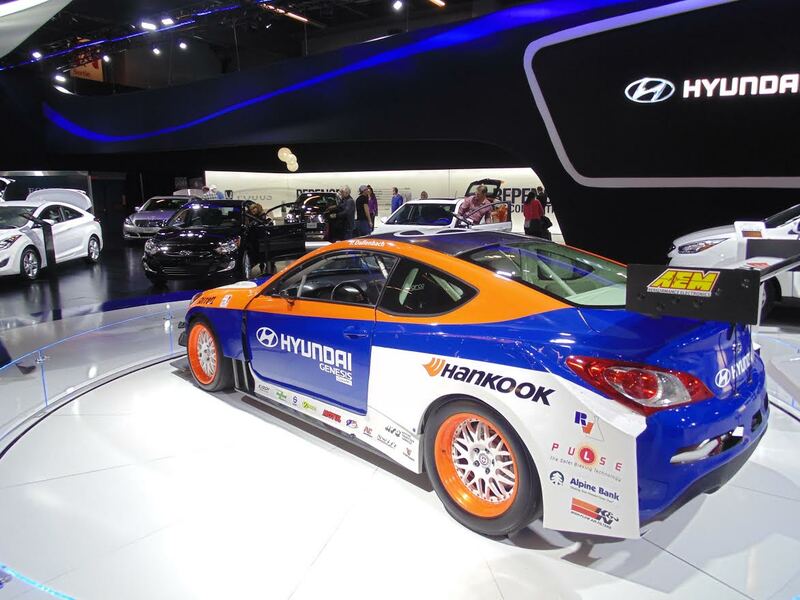 Being long-time Hyundai fans, one of the debuts from the show we enjoyed was the RMR Red Bull Genesis Coupe Race Car. Beauty and function coalesce seamlessly in this road-going temptress. Developed with rally racer/drifting superstar Rhys Millen and his firm RMR (Rhys Millen Racing), the new car boasts a 550-hp engine, a stripped and strengthened body and not a whole lot else. To achieve its 2400 pound weight, all interior components (not needed to anchor the driver) were taken out, the steel was swapped out for lighter carbon fibre panels with liberal splitters, air dams, and ducts to allow massive amounts of air flow while it’s in motion. An APR GTC-500 rear wing keeps the car’s rear end firmly grounded while it lays waste to the pavement. Lightweight Enkei RPF1 wheels are substituted for the stock wheels, while the newly installed Toyo Proxes R1R tires will surely take a lot of punishment during the car’s lifetime. A couple of unusual offerings came in the form of the T-Rex 16S and the V13R by Montreal-based Campagna Motors. Proceeding from their concept in 1988, they released the company’s first production model in 1995. These three wheel open air vehicles are very attractive, and fun to drive. Fitted with a BMW 6 cylinder 1649cc engine, they are also quite spirited. They get about 30mpg, so a 400 km driving range on one tank of gas is the norm. Mon dieu! Another fascinating find at this year’s show was the Tomahawk, an ultra-light supercar kit from Dubuc Super Light Cars (SLC) hailing from Quebec City, Quebec. It will sell for less than $30,000. Based largely on the 4th gen Corvette suspension, the chassis and body are composed of aluminum and polymers respectively. All interior components are there, and look fantastic. The buyer puts their own engine in, of any displacement, and will be able to use either an internal combustion or an electric engine. After about 250 hours of work and presto, your very own super-car, and a highly unique one at that. Sacre bleu! Of course, we can’t fail to mention the newest iteration of the original pony car, the 2015 Ford Mustang. Celebrating a half century of this automotive icon calls for something big, and Ford has delivered in spades. It is slightly smaller than the old car, with increased interior room and enhanced fit and finish. For the first time, the Ford MyTouch touchscreen menu will be available in this car. An independent rear suspension is the big news, finally replacing the solid rear axle. This will help out handling and ride comfort, putting it on par with its European competition. More fuel efficient engine choices offered up by the blue oval also have this rivalry in mind. The die-hard speed fanatics needn’t worry though, there are several high performance variants in the works. There are even rumours of a special Mustang release (the SRA) with that old solid rear axle, to continue to appeal to the drag racing crowd. As for the new styling? It’s very easy on the eyes; really quite a gorgeous car, inside and out. It should continue to do the Mustang legacy proud as it embarks on its next half century. Other special attractions were the finalists for the 2014 Canadian Car of the Year. Ranging from the economical (Mazda 3) the luxurious (Mercedes Benz S class) the fastest (Chevrolet Corvette Stingray) to the heavy hauler (GMC Sierra), all these vehicles were deemed exceptional in their respective classes. The winner will be announced next month during the Toronto International Auto Show. This show is the first chance for all the auto makers to present their wares in one setting to prospective Canadian buyers. The Quebec market is a vital region in this regard, so they’ve pulled out all the stops to impress the car enthusiasts here in Montreal. 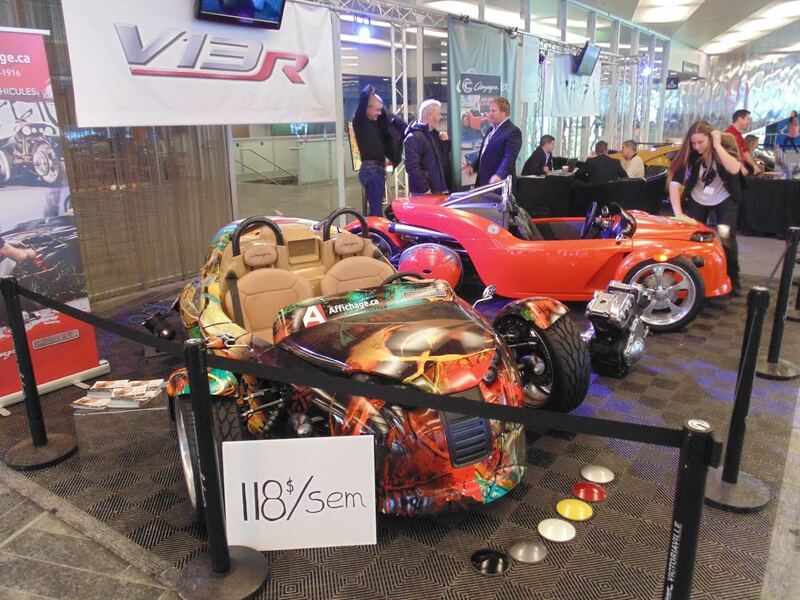 All in all, they’ve done a bang-up job at this year’s Montreal Auto Show.